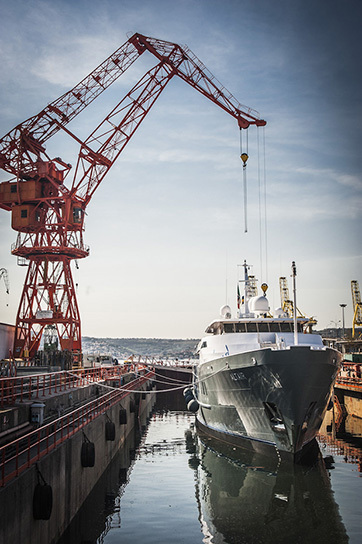 TRS offer a wide range of services regarding the construction of new superyachts and the refitting of existing ones. In particular, TRS specializes in design engineering, basic naval design, naval architecture calculations, static and dynamic FEM calculations and especially projected noise calculations using cutting-edge tools and software. TRS provides its clients with trained, experienced consultants for the designed and surveying phases. For each refitting project, TRS provides a dedicated project manager. TRS’s dry docks are equipped with a 20 t gantry crane, 30 t movable crane, three warehouses for a total of 2.000 square meters, a cherry picker with a maximum reach of 27 m, two high-pressure washers (up to 2.500 bars), two airless pump paint sprayers, and two forklifts (3 t and 5 t). TRS can leases three dry docks, with a maximum length of 295 m.
TRS has over 300 m of quays both near the dry docks and the nautical hub of the Canale Navigabile; at this latter location there are also 240 m of mooring pontoons. 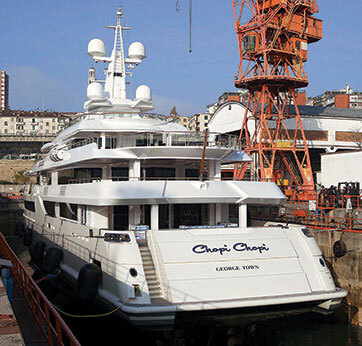 The water is deep enough to allow superyachts with a draft of up to 6 m to dock regardless of tide. There are no shoals or shallows along the approach route to the quays. Wi-fi is available on the quays. Spare parts warehouses are available for a total surface area of 1.000 square meters, and a dedicate surveillance service is also available. TRS provides Volvo Penta, Northern Light and FPT authorized assistance and staff specializing in MTU and Caterpillar. TRS is able to provide aluminium alloy superstructures to modify hulls and extensions, and can perform construction and repairs using metals and aluminium. In collaboration with leading companies in the surface preparation and painting sectors, TRS uses cutting-edge technologies for excellent results even in the most complex maintenance operations. TRS assists and advises its clients regarding the design, construction, and outfitting of yacht interiors and exteriors. TRS works closely with selected artisans and can provide the finest Italian and international products. TRS provides tailor-made solutions to make yacht interiors and exteriors as comfortable and unique as possible. Thanks to TRS location, shipowners and crews can take full advantage of Trieste’s accommodations, restaurants, and tourist attractions. Whether for a brief stay or a longer refitting sojourn, our Concierge Department is at the full disposal of our clients to advise and assist them regarding booking and organizing travel and accommodations. Trieste is a city rich in culture, and its surroundings have plenty of natural attractions to go along with excellent high level cuisine.